We are pleased to inform you that we have released 6 sizes (SS, S, M, L, LL, and EL) of our new slide base "Flexi Slide Base" in the hope that our multi-undercut-free device, "LOSECON®-30PAT." will be a "Perfect Component" and will further contribute to our customers. We have prepared CAD data by adding the "Flexi Slide Base" data to the existing "LOSECON®-30PAT." data. Please use it. ”Regarding component template data of "LOSECON®-30PAT. "” Please confirm it. ※It is approval. After Takao approves, the file is issued. Regarding component template data of "LOSECON®-30PAT." 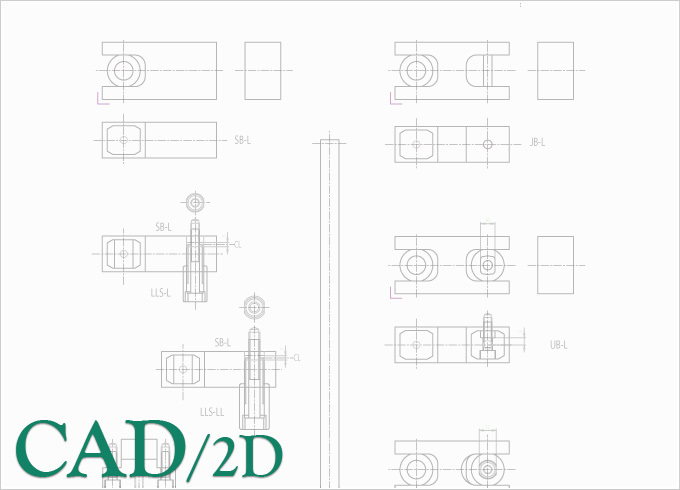 The CAD data that we will provide is assumed to be used for checking unit arrangement and interference in layout design using CAD. Some portions may differ from actual products such as chamfering and R-processing. The CAD data shall be used at user's own risk. Please be aware that we shall have no liability for any loss or disadvantage attributable to the CAD data. The copyrights of the CAD data and all information included in the CAD data are vested in TAKAO INJECTION MOLD ENGINEERING Corporation and protected under copyright laws and international treaties. You may not use the CAD data (replication, modification, upload, notification, transmission, distribution, license, sale, publication and the like included) for other than layout design without obtaining our permission. If the CAD data is used in noncompliance with the aim of using CAD data, we may have legal recourse against the user.